Personality traits are often related to psychopathology- some psychiatric disorders may represent the extreme end of a continuum of personality traits. For example, schizotypal personality traits are like the symptoms in schizophrenia, but in a much weaker form. Even healthy people without a psychiatric illness might feel paranoid at times, experience excessive social anxiety, or report unusual perceptual experiences, such as feeling the presence of “spirits.” These phenomena are not uncommon and there is normal variation in the degree to which people have these thoughts and experiences. 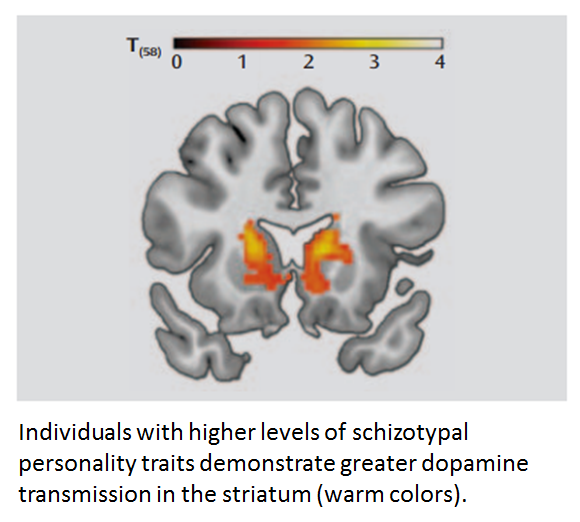 In collaboration with Dr. David Zald in the Department of Psychology, we found that normal variation in schizotypal traits is associated with dopamine signaling in the brain. Combined with the findings in patients with schizophrenia, our data suggest that there may be a continuum between dopamine and schizotypal traits/schizophrenia symptoms. We have also assisted on several additional studies looking at the relationship between dopamine function and psychopathic personality traits, impulsivity, and cognitive flexibility.